Left a couple of messages with our SS this morning to call me back to confirm our inspection date and time - we were unsure of whether it'd be the 20th (this Friday!) or next Tuesday 24th. I'd booked both days off just in case, but since work is crazy busy I need to be working at least one of those days. Got a call back at closing time to confirm - it's ON for this Friday August 20th at 1:30pm! Wish us luck, readers! We haven't been inside the house for what feels like decades now, excited at seeing the "finished" product. Hoping there's not too many defects to be picked up. Now it feels like the business end of things, have to start arranging insurance, driveways, flooring, window coverings etc, as well as finding out about the final amount and adjustments. Finally, a pic from the weekend - sorry about the weird angle, was holding the camera above the temp fence and couldn't see where it was pointing, but it does show our facade up/down lights; two on either side of the french doors, and one on each balcony pillar. They look a bit smaller than we expected, but that's probably because the balcony is a lot bigger than we thought it'd be. 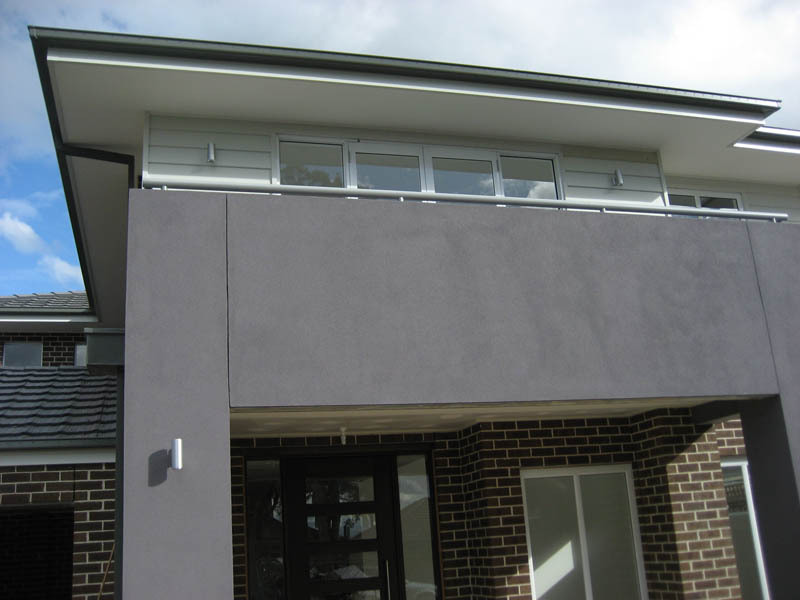 The colour of the balcony has matured nicely too - when the paint was first applied it was insanely bright purple, but it's calmed down to a nice modern shade. You can also see some unpainted plastering in the portico and the portico light fitting in front of the door, which we'll change over to a sensor light, one day... oooo, and the big pull handle on the front door! Best of luck with the inspection guys! Goodluck guys! Love the blog. Don't forget to post lots of photos when all complete. Oh I'm so excited for you and nervous too. I've been following you guys for ages I feel like I know you both!! congrats and keep us updated. Big hugs to you both, Helen M.
We are building too and soooo happy and nervous for you. We joke that we follow your house progress more than ours even :) We find Metricon is not so good with communication sometimes thing don't get fixed for ages. Our roof is now finally up after 4 months and we paid for double bifold doors that sit in the rain for that long. Not happy with them for all the excuses they often make up but they won't replace the over-damped doors now. Best of luck guys, will you get the house they ? or you have to wait again ? it seems forever doesn't it. In our case, from the time we approach Metricon (Jan 2009) until our lock up invoice has just arrived. Slow for sure. All the best for handover Tin & Tina, cant wait to see the finished pics from the inside! All the best and remember to take your time. We are sooo excited for you! Good luck! We have been reading your blog for a while now and have appreciated all the information, thanks! We are just about to start our adventure with M... Yippee! How exciting - best of luck Friday!!!!! Funny - you're finishing up and we're starting next week!!!! All the very best for your inspection. We've just begun reading your blog and it's been very interesting. We're also building the Nolan. Just wondering if you had ever gone through the process of getting a quote from Metricon for refrigerated airconditioning. We just got a quote back from Lifestyle National and it's $26,985 despite being originally quoted 20K (sigh). It looks like we may have to go for evap cooling for upstairs and splits downstairs. Actually I like the weird angle, gives the shot a modern advertising feel to it. Anyway just dropped by to wish you all best for your completion inspection tomorrow.